Individual change management means understanding how one person successfully makes a change. Organizations don't change, individuals do. No matter how large of a project you are taking on, the success of that project ultimately lies with each employee doing their work differently, multiplied across all of the employees impacted by the change. Effective change management requires an understanding for and appreciation of how one person makes a change successfully. Without an individual perspective, we are left with activities but no idea of the goal or outcome that we are trying to achieve. Organizational change management understands what tools we have to help individuals make changes successfully. 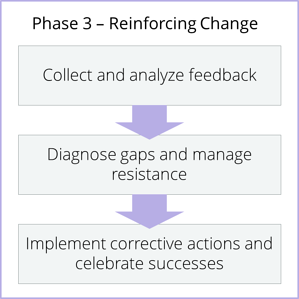 While change happens one person at a time, there are processes and tools that can help facilitate this change across groups and organizations. Without a structured approach, change management tools can be limited to only communication and training. When there is an organizational change management perspective, a process emerges for how to scale change management activities and how to use the complete set of tools available for project leaders and business managers. ADKAR describes successful change at the individual level. When an organization undertakes an initiative, that change only happens when the employees who have to do their jobs differently can say with confidence, "I have the awareness, desire, knowledge, ability and reinforcement to make this change happen." Prosci's organizational change management process was first introduced in 2002 after the third change management benchmarking study. This process is built in three phases that a project or change manager can work through for the changes and initiatives they are supporting. The methodology includes research-based assessments and templates to support each phase, as well as guidance for completing each step most effectively. "How much change management does this project need?" This provides insight into the change at hand, its size, scope and impact. This gives a view of the organization and groups that are being impacted and any specific attributes that may contribute to challenges when changing. This provides an understanding of the leaders across the organization who will need to act as sponsors of the change. Here we also identify possible challenges with certain leaders and start to formulate plans to get those leaders on board and actively sponsoring the change. This assessment identifies the groups of individuals being impacted by the change, in what ways they are being impacted, and unique challenges you may face with this group in the project. Based on the assessments in this phase, a strategy that scales the change management effort to align with the type and size of the change is articulated. Communications are a critical part of the change process. This plan articulates key messages that need to go to various impacted audience. It also accounts for who will send the messages and when, ensuring employees are hearing messages about the change from the people who have credibility with them and at the right time. The sponsor roadmap outlines the actions needed from the project’s primary sponsor and the coalition of sponsors across the business. In order to help executives be active and visible sponsors of the change, we provide details on when and where we need leaders to be present, what communications they should send, and which peers across the coalition they need to align with to support the change. Training is a required part of most changes, and is critical to help people build the knowledge and ability they need to work in a new way. The training plan identifies who will need what training and when. It is important that the training plan be sequenced in a way that allows for awareness and desire building before they are sent to training. The coaching plan outlines how you will engage with and equip managers and people leaders to lead the change with their own teams. Managers can play a significant role in aiding the change management efforts, but they need to be engaged as employees themselves first and allowed to work through their own change process. Then you can give them the information and tools to lead the same change process with their own teams. The resistance management plan provides a strategy for both proactively and reactively addressing resistance. At the outset of a project, anticipated areas of resistance can be identified and proactively planned for: specific activities targeted at potentially resistant groups. This can head off resistance before it becomes a problem. The resistance management plan should also include the process and plan for identifying, understanding, and addressing resistance that comes up throughout the life of the project. As the change is being implemented and the solution of the project is going live, it is important to establish measures to see if people are actually doing their jobs in a new way. These measures will be unique to each project and based on what new behaviors are required of employees in the changed state. If gaps are identified and people are not fully adopting and using the new way of working, the change and project team must take action to correct those gaps. It is important to remember ADKAR in this phase and identify accurately why people may not be embracing the change and address the root cause of the gap. Because people are physiologically wired for habit, it is common that even though people may change successfully, they will revert to their old habits unless there are specific measures in place to prevent them from doing so. Reinforcement mechanisms can include continued compliance measuring, ongoing training and coaching. It is vitally important to recognize the hard work people have put in to embracing change. Every person and organization is different, so it is important to look for means of recognition that will resonate with the individuals. In addition to recognizing the achievements of individuals and groups who have changed successfully, it is important to publically highlight the success of the initiative and provide opportunity to celebrate the hard work that went into getting to a new future state. As is common in project management, an after-action review of the change management efforts helps to identify strengths of the change effort to be replicated in future projects, as well as areas where different action should be taken next time to drive a more successful outcome. The link between individual change management and organizational change management is key and is what sets Prosci's approach apart from other change management methodologies. There are numerous models available that address individual change. There are also numerous models available that give guidance and structure to the project-level activities for the people side of change. The Prosci methodology uniquely integrates individual change management and organizational change management to ensure the achievement of business results. 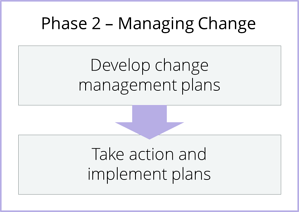 The image below shows how the change management plans developed in the organizational change management process contribute to the progression of individual change described by the ADKAR model. This is the essence of effective change management and the Prosci methodology: leverage change management activities to drive individual transitions. 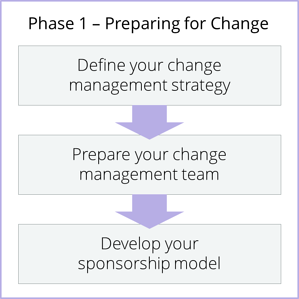 In three of the last five change management best practices studies, the use of a structured approach to change management was cited as the second greatest contributor to success (behind only active and visible executive sponsorship). A structured approach to change management moves organizations away from merely reacting to resistance to change and provides a solid framework for engaging and mobilizing impacted employees. Participants also indicated whether or not they used a structured approach to change management. The data in the 2017 study showed a slight decrease in the number of participants following a particular change management methodology. The percentage of participants utilizing a methodology more than doubled between 2003 and 2013. Today, 7 in 10 projects are utilizing a structured change management methodology, whereas four years ago, in the 2013 study, nearly 8 in 10 did. Participants shared data on when they started their change management activities and when they would start their activities on the next project. The data shows an overwhelming bias toward initiating change management early in the project. Change management activities that are launched at the beginning of a project can be more proactive in addressing the people side of change. When change management is brought in as an add-on late in the project, it is typically to 'fight fires' and help with damage control. 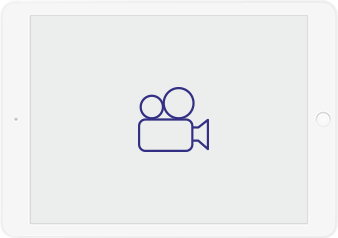 This webinar presents Prosci's Change Management Methodology, including the Prosci ADKAR Model for individual change and the Prosci 3-Phase Change Management Process for organizational change. Learn how the fusion of individual and organizational change management is necessary to drive project results and outcomes.